Background & objectives: The nature of the rickettsial antigens and the immune response generated by them, have been the subject of exhaustive research so that a suitable vaccine can be developed. Till date evaluations of Rickettsia rickettsii antigens that induce both humoral and cellular responses in animal models have only shown partial protection and short-term immunological memory. This study was aimed to evaluate the immune response induced by DNA plasmids generated from the OmpA and OmpB genes of R. rickettsii in peripheral blood mononuclear cells of rickettsial (sensitized) patients compared to healthy subjects. Methods: Plasmids OmpA-49, OmpB-15 and OmpB-24 were generated in the pVAX vector. Macrophages derived from the THP-1 cell line were transfected in vitro with the plasmids and were co-cultured with T-lymphocytes from sensitized subjects and healthy subjects to evaluate cell proliferation and cytokine production. Results: The OmpB-24 plasmid induced proliferative response in human lymphocytes, with production of IL-2, IFN-γ, IL-12p70, IL-6 and TNF-α, likely due to the presence of conserved epitopes among R. rickettsii, R. typhi and R. felis (differing from 1 to 3 amino acids) during the construction of the plasmids. Interpretation & conclusion: DNA sequences of rickettsial epitopes can be cloned into the pVAX vector. Constructed plasmids can generate a proliferative response and produce cytokines in vitro, in co-culture of transfected macrophages with sensitized human lymphocytes. Plasmid OmpB-24 proved to be the most immunogenic with respect to plasmids OmpA-49 and OmpB-15. Rickettsia rickettsii, the causal agent of Rocky Mountain spotted fever (RMSF), is an obligate intracellular bacterium that resides mainly in ticks of the family Ixodidae. It often generates self-limited clinical pictures, but may cause long-term sequelae, or can be fatal, if not treated. Currently, there is no effective vaccine against rickettsial diseases and the development of suitable control strategies is important, since there are no commercial methods available for its diagnosis, particularly in vulnerable communities that are away from the specialized health services, and it also has clinical symptoms similar to other pathologies, such as dengue, that might delay the treatment. Vaccines using crude antigens or inactivated microorganisms were partially protective and had adverse reactions,,,. 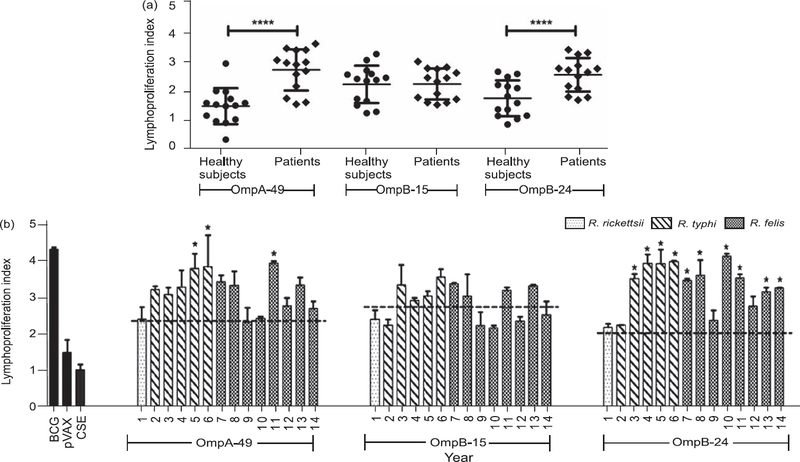 The generation of DNA vaccines against the OmpA and OmpB rickettsial proteins have shown increased immunity in murine models infected with R. conorii and R. rickettsii. Presently, the most promising DNA vaccine is based on R. rickettsii OmpA protein which stimulates a protective immune response in mice with a lethal dose of R. conorii. In addition, the production of IFN-γ by T-lymphocytes suggests stimulation of a cellular immune response. Recombinant antigens from genotypically conserved OmpB sequences to all rickettsial species have been used to evaluate their protection against lethal infection with R. conorii in C3H/HeN mice. The recombination of the surface protein Adr2 with OmpB has also been evaluated. The results showed that each protein individually induced a significant specific response, supporting the role of OmpB. However, evaluation of OmpA and OmpB proteins in murine models might be a limiting factor when compared with human models. The use of transgenic mice in human leukocyte antigen type-1 (HLA-I) and HLA-II, as well as humanized mice capable of expressing various human HLA, have been reported as feasible strategies with great human implication,,. Because of the intracellular nature of R. rickettsii, the experimental strategy to follow is to identify T-lymphocytes, that specifically recognize the epitope processed and expressed in HLA-I molecules. Naturally activated T-lymphocytes (first exposure) can be reactivated in vitro (second exposure), and their immune activity can be compared with that of the lymphocytes from healthy subjects. This strategy has been evaluated in lymphocyte cultures of patients sensitized with R. typhi or R. prowazekii with lymphoblastic cells infected with the same rickettsial species, confirming the effect of cytotoxic T-lymphocytes and cross-immunity,. Ex vivo trials, using macrophages or dendritic cells as antigen presenting cells (APC) in co-culture with sensitized lymphocytes, generate high expectations with high predictive value and greater human profile than any preclinical strategy,,. These trials supplemented with in silico studies support the potential of APC-based antigen strategies in search of potential vaccine candidates, as documented for R. prowazekii and R. typhi. Although OmpA and OmpB have been proposed as protective antigens, there is no evidence that these proteins effectively prevent rickettsial diseases. The objective of the present study was to evaluate the immunostimulating effect of DNA plasmids generated from OmpA and OmpB genes of R. rickettsii in mononuclear cells of patients with positive diagnosis of Rickettsia. OmpA-49 (1.7 Kb), OmpB-15 (1.2 Kb) and OmpB-24 (1.7 Kb) fragments containing the majority of the open reading frame for OmpB and OmpA of R. rickettsii, were amplified and cloned by using site-specific PCR primers. OmpA-49: 5′-ATGGCGGCTAATTCGGTTGGTGA-3′ and 5′-CCGACACCGACATCAAAACTT-3′ (1.7 Kb); OmpB-15: 5′-ATGAATGTTGCGGTGACAAATAA-3′ and 5′-ACTACGTTACCGGGACCAGAAA-3′ (1.2 Kb); OmpB-24: 5′-ATGGTCGGTGGACAGCAAGGTAA- TAAG-3′ and 5′-GGTAACGATAGCTCCAACAAAG-3′ (1.7 Kb). The alignment temperature and MgCl2 concentration were as follows: 66°C and 2.5 mM for OmpA-49, 60°C and 2.5 mM for OmpB-15, and 60°C and 3.5 mM for OmpB-24. The reaction mixture included 100 ng of DNA, 0.1 UI of Taq DNA polymerase, 20 μM of each deoxyribonucleotide (dATP, dCTP, dGTP, and dTTP), and 0.4 μM of each primer, in a final reaction volume of 25 μl. Amplification conditions were as follows: 30 cycles at 95°C for 1 min and 72°C for 2 min of final extension. The amplification products (10 μl) were separated and identified by electrophoresis in an 8% polyacrylamide gel stained with ethidium bromide (0.5 mg/ml), and visualized in an ultraviolet light (UV) Transilluminator. The fragments were ligated to the mammalian expression vector pVAX (Invitrogen, Carlsbad, California) and transformed into competent E. coli DH5-a cells according to the manufacturer’s instructions. Transformants bearing plasmids containing rickettsial DNA fragments were identified by sequencing. Orientation and frame relative to the cytomegalovirus promoter, were confirmed by DNA sequence analysis with ABI PRISM® 310 (Applied Biosystem, USA) sequencer at the Institute of Biotechnology, Cuernavaca City, Mexico. All plasmid constructs were maintained in the E. coli transformants under kanamycin selection in ZMY505 medium, and large-scale concentrated plasmid preparations (250 μg/ml)of these constructs were generated using HiPure Plasmid Filter Maxiprep kit (Invitrogen, CA, USA) according to the manufacturer’s instructions. Macrophages derived from THP-1 cells and transfection method: THP-1 cell lines were adjusted to 1 × 105 cells per ml and placed into 24-well culture plates (Corning, NY, USA). THP-1 cells were induced with 100 nM phorbol myristate acetate (PMA) at 37°C and 5% CO2 for 4 days, incubated with RPMI-1640 supplemented with 10% fetal bovine serum (Gibco, Grand Island, NY, USA), 1% of streptomycin/amphotericin B (Gibco), 1% of hepes, 0.05 mM β-mercaptoethanol, 2 mM L-glutamine (Gibco). Then, each diluted recombinant plasmid DNA (5 μg) was added with the Lipofectamine LTX (Invitrogen) diluted in 100 μl of Opti-MEM (Invitrogen), the mixtures were incubated at room temperature for 30 min to allow DNA-Lipofectamine LTX complexes to form.The DNA-Lipofectamine LTX complexes (100 μl were then added directly to each well, mixed gently, and induced for 48 h at 37°C and 5% CO2. Macrophages derived from THP-1 cells (1 × 105 cells) grown to 80% confluence were transfected with the mammalian expression vector pEGFP-N1 (Clontech, Mountain View, CA) and examined at 24, 48, and 72 h. Transfection procedures were performed as indicated by manufacturer (Invitrogen). The ratio between DNA (μg) and transfection reagent (μl) was always 3:1. Plasmids expressed in macrophages: To determine the plasmid expression macrophages transfected were harvested and treated with TRIzol reagent for RNA extraction, following the manufacturer’s recommendations. The purified RNA was resuspended in DEPC water, quantified by spectrophotometry, and stored at –70 °C until use. The cDNA was obtained from RNA by reverse transcriptase reaction using the ImProm II kit (Promega, USA). PCR was performed using the conditions described for OmpA-49, OmpB-15, and OmpB-24 sequences. OmpA-49, OmpB-15, and OmpB-24 detected by indirect immunofluorescence: Polyclonal antibodies against the OmpA-49, OmpB-15 and OmpB-24, were generated in BALB/c mice. Groups of mice were immunized with plasmids expressing the sequences at intervals of 15 days. One group of mice was inoculated with the plasmid pVAX without insert as a negative control. At Day 45, mice were bled by cardiac puncture to obtain serum. Polyclonal sera with titres 1: 64 were incubated with transfected macrophages for 30 min at 37 °C on culture plates. The antimouse IgG antibody conjugated to fluorescein (FITC) was used to detect the reaction according to the conditions of the manufacturer (Sigma, San Luis, Missouri, USA), and visualized in a fluorescence microscope. Performance was calculated by the ratio of fluorescence (fluorescent cells/cells in visible light × 100), averaging five fields. Serum obtained from mice inoculated with empty pVAX was used as a negative control. A total of 14 patients and 14 healthy subjects as controls, matched for age (not older than 65 yr) and gender, were included in the study. Patients were clinical cases with positive serology and PCR to rickettsia, detected as part of community service at the Laboratory of Emerging Diseases and Re-emerging of the Regional Research Center “Dr Hideyo Noguchi” of the Autonomous University of Yucatan, Mexico. Blood samples from patients and healthy subjects were obtained under prior informed consent. Healthy subjects or patients with any acute infection or newly vaccinated were excluded. The study was approved by the Ethics Committee of Agustín O’Horán Hospital. Confidentiality of participants was strictly maintained. Serological diagnosis of patients: Patients serum samples, diluted in 2% PBS/BSA (1: 64 titer), were incubated for 1 h at 37 °C on slides containing Vero cells infected with R. rickettsii and R. typhi. Subsequently, FITC-conjugated anti-IgM (Sigma F5384) or IgG (Sigma F6380) secondary antibody diluted 1: 100 in PBS/2% BSA was added, incubating at 37 °C for 1 h. At the end of the incubation the slides were washed with PBS, allowed to dry and the solution Airvol (Polyvinyl alcohol) (Sigma Aldrich P8136) was added. The samples were observed on a fluorescence microscope (Nikon Eclipse, TS-100F, UK). A negative serum sample and pathogens related to Rickettsia were used as a negative control. Characterization of rickettsial species involved in clinical cases by PCR/RFLP: The diagnosis of rickettsia was established by PCR for Rickettsia 17 kDa and citrate synthase (gltA) genes as described previously,. Positive controls were DNA ofR. felis, R. rickettsii, R. akari, and R. typhi, and a reaction without DNA was used as a negative control. The DNA of patients and controls were handled separately to avoid contamination. Rickettsia rickettsii was identified as the causal agent by restriction fragment length polymorphism (RFLP) analysis of the amplified fragment of gltA (382 bp) and 17-kDa gene (434 bp) by using AluI as described previously,, and by comparing the DNA sequences of the gltA and 17-kDa gene PCR amplicons using BLAST software of the National Centre for Biotechnology Information (Bethesda, MD, USA),. Mononuclear peripheral blood cells (PBMC) were obtained from heparinized venous blood (15 ml) of patients and healthy subjects by centrifugation with Ficoll gradient (Nycoprep, Axis Shield). PBMCs were collected, washed and cultured in RPMI-1640 fetal serum free to promote adhesion of monocytes. Non-adherent cells (lymphocytes) were recovered and co-cultured for 72 h with transfected macrophages (1.5 × 105 per well) at 2 : 1 in RPMI-1640 fetal serum free with antibiotics, for 72 h at 37°C in 5% CO2 and 95% humidity. Triplicate assays were performed using macrophages transfected with empty vector pVAX, and untransfected cells (SC) as negative controls, and stimulated macrophages with BCG vaccine as a positive control. Cell proliferation was measured by colorimetric reaction (reduction Methyl Tetrazolium salts) using an ELISA reader at a range of wavelength 500 to 600 nm. A non-parametric Wilcoxon test for paired data and student’s t-test were performed to determine significant differences (p < 0.05) between the proliferation of lymphocytes in the patient group and the group of healthy control subjects using three plasmids. Levels of IL-2 (DRG Diagnostics, Marburg, Germany), IFN-γ (DRG Diagnostics, Marburg, Germany), IL-12p70 (DRG Diagnostics, Marburg, Germany), TNF-α (R & D Systems, Minneapolis, Minnesota, USA) and IL-6 (Invitrogen, CA, USA) were determined in culture supernatants by ELISA. Samples were analysed in duplicate and concentrations calculated from the absorbance values were recorded using the standard curve constructed for each cytokine according to the supplier’s directions. Index absorbance, lymphoproliferation and statistical analyses were performed in SPSS (IBM) programme and the Wilcoxon test for paired data. Rickettsia rickettsii sequence (Gene Bank accession number cp000848.1) was analysed for the presence of at least one peptide with affinity to HLA-I alleles A0201, A24, B3501 and B3901 (unpublished data). Rickettsial species sequences and bioinformatics were analysed using the Clustal W package, and BioEdit software. The amplified OmpA-49, OmpB-24 and OmpB-15 (PCR products) were successfully cloned into pVAX vector and used to transfect macrophages. Transcription of the R. rickettsii OmpA and OmpB sequences in transfected macrophages: Plasmids containing rickettsial OmpA-49, OmpB-24 and OmpB-15 fragments were purified and successfully transfected with cationic lipid transfection method into macrophages. The plasmid vector pVAX contains human cytomegalo virus (CMV) immediate-early promoter/enhancer that permits efficient, high-level expression of the exogenous protein. Amplification of the fragments after 48 h transfection was verified by RT-PCR. The results showed that the transfection was carried out efficiently since plasmids were capable of transfecting cells under a liposome system and able to generate the transcripts [Figure 1]. 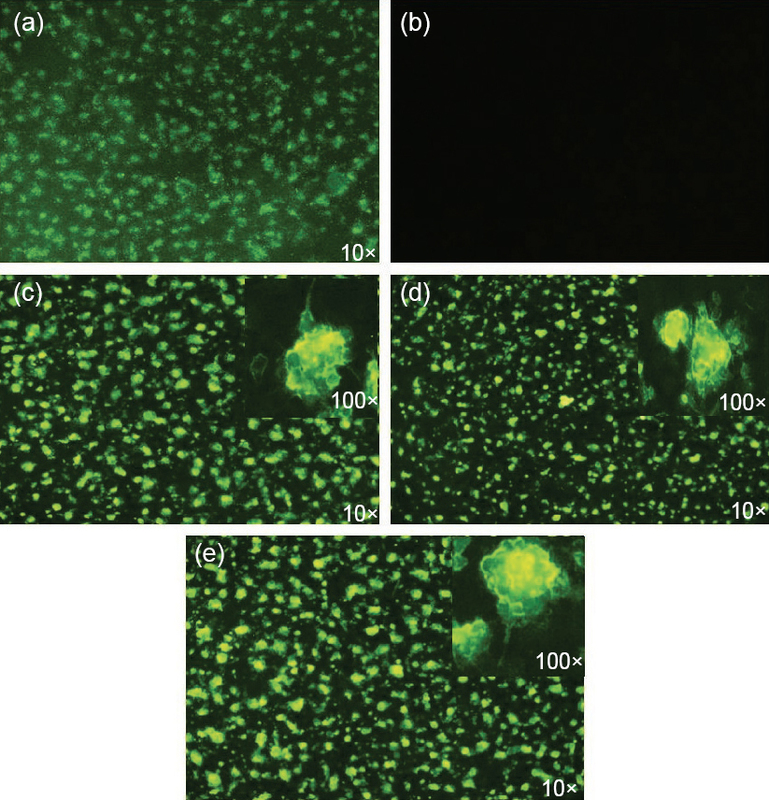 Figure 1: Detection of plasmids on transfected macrophages—(a) OmpB-15; (b) OmpB-24; and (c) OmpA-49 fragments amplified by RT-PCR and visualized in 10% polyacrylamide gels stained with Ethidium bromide. Lane 1—1 Kb plus DNA Ladder marker; Lane 3—Negative control; Lanes 4 and 5—Amplified products at 18 and 48 h, respectively. OmpA-49, OmpA-15, and OmpA-24 fragments detected by indirect immunofluorescence: Plasmid pEGFP-N1, which determines auto fluorescence, allowed production of 80% of EGFP recombinant protein (26 kDa) identified by fluorescence microscopy. The results showed that macrophages expressed the rickettsial plasmids at 48 h of transfection on their membrane, indicating that the generation of antigen-presenting cells was successful [Figure 2]. Figure 2: Rickettsial plasmids expressed in macrophages at 48 h of transfection—(a) pEGFP-N1 (Positive control); (b) OmpB-24 (Negative control, performed with pre-immune serum); (c) OmpA-49; (d) OmpB-15; and (e) OmpB-24, detected by indirect immunofluorescence (10× and 100× objective). Study population: The analysis of clinic characteristics of both the groups [14 subjects with positive diagnosis of Rickettsia (8 with R. felis, 5 with R. typhi, 1 with R. rickettsii) and 14 healthy subjects] are summarized in [Table 1]. Rickettsial fragments presented by macrophages transfected to sensitized lymphocytes: To determine, whether lymphocytes from patients previously infected with Rickettsia show memory in response to cloned proteins, they were co-cultured with transfected macrophages and the proliferative response was assessed by MTT colorimetric test, at 72 h. Data showed significant differences in lymphoproliferative response to OmpA-49 and OmpB-24 in patients relative to controls. OmpB-15 showed no significant difference between the study groups [Figure 3]a. The lymphoproliferative response in patients who became sick due to R. felis, R. typhi and R. rickettsii, using plasmid OmpA-49, showed a significant increase (p = 0.0001) in two patients with R. typhi and one with R. felis, with respect to the control subjects [Figure 3]b. No significant differences (p = 0.6698) were found in the lymphoproliferation induced by macrophages transfected with plasmid OmpB-15 between patients analysed. Furthermore, analysis showed a significant increase (p = 0.0001) in proliferation of lymphocytes from 10 patients (4 to 6 for R. typhi and R. felis) employing the OmpB-24 plasmid [Figure 3]b. Figure 3: Lymphoproliferation index induced by OmpA-49, OmpB-15, and OmpB-24, in patients (n = 14) and healthy subjects (n = 14)—(a) Lymphoproliferation index obtained by triplicated test for each patient and healthy subjects. Wilcoxon test for paired data; ****p = 0.0001; and (b) Lymphoproliferation index by groups; Dotted line indicates the average value in healthy subjects. BCG—Vaccine (Positive control); pVAX— Vector (Negative control); CSE —Unstimulated cells; Student's t-test, *p < 0.05. Cytokines produced by lymphocytes: IL-2 was found increased in 11 supernatants of co-transfected cultures with OmpA-49, three with OmpB-15 and in nine supernatants with OmpB-24. Significant differences (p < 0.05) were observed between the levels of IL-2 from patients and control subjects with plasmid OmpA-49. Although no significant difference was observed between patients and controls by using the plasmid OmpB-24, the group of patients produced higher levels of IL-2. This was because the standard deviation and scattering of data was large, which prevents demonstration of statistical significance between the different data sets [Figure 4]a. Figure 4: Cytokines detected in culture—(a) IL-2; (b) IFN-γ; (c) IL-12p70; (d) TNF-α; and (e) IL-6 detected by ELISA test in supernatant of lymphocytes from patients and healthy subjects with macrophages transfected with OmpA-49, OmpB-15, and OmpB-24 of R. rickettsii, at 72 h of culture. Results from triplicate cultures are shown (± 1 SD); Wilcoxon test for paired data, *p < 0.05. IFN-γ was found increased in four supernatants of co-transfected cultures with OmpA-49, six with OmpB-15, and in four with OmpB-24. Significant differences were observed in the levels of INF-γ between the patient group and the control group [Figure 4]b.
Cytokines produced by macrophages: IL-12p70 was increased in three supernatants with the three plasmids. The patients group showed statistically significant differences in levels of this cytokine by employing transfection with plasmid OmpB-24 indicating that this plasmid favours its production [Figure 4]c. TNF-α values above the mean were obtained in 11 supernatants with OmpA-49, 10 with OmpB-15, and in 12 with OmpB-24. Results showed highly significant differences between patients and controls with the three plasmids [Figure 4]d. IL-6 was found to be increased in 11 supernatants with OmpA-49, 13 with OmpB-15, and in 11 with OmpB-24. Significant differences were obtained between patients and controls with the three plasmids [Figure 4]e. Macrophages with empty vector pVAX and untransfected cells did not stimulate lymphoproliferation or cytokine secretion. The OmpA protein contains 14 epitopes, of which only one can be coupled to three HLA-I alleles (promiscuity) while the rest are promiscuous for two HLA-I alleles. The OmpB protein contains five epitopes of which one exhibit promiscuity for four alleles (position 24) when analysed in 10 different Rickettsia species; one peptide is promiscuous for three alleles and the three remaining are promiscuous in alleles. The expression and coupling affinity to HLA-I for all peptides was ≥ 70. Analysis in the BLAST search engine indicated that peptide does not present homology with human sequences. Highly conserved epitopes were identified in the OmpA and OmpB sequences rationalizing the cross-proliferation results obtained in the lymphocytes of patients who became diseased by R. thypi, R. felis and R. rickettsii. 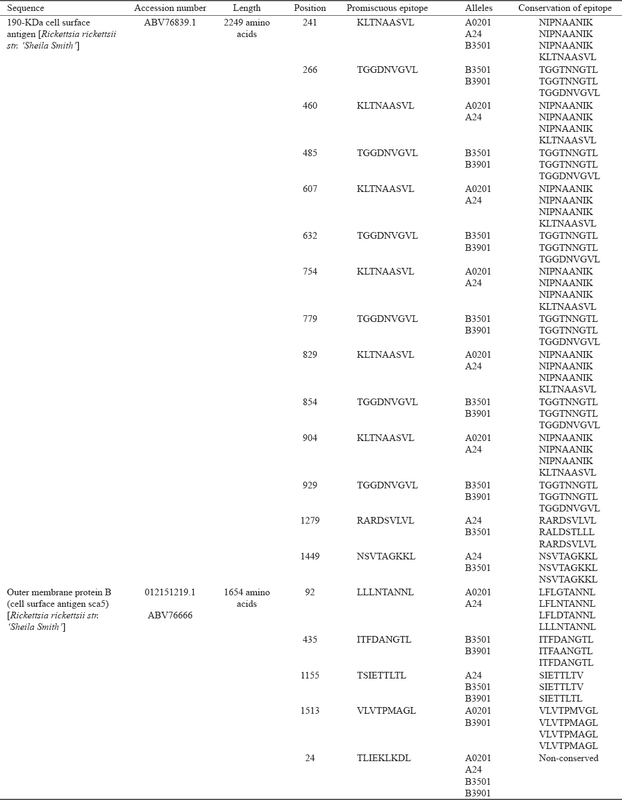 The OmpB sequence presented a non-conserved epitope (TLIEKLKDL) which could be used for the development of a possible specific species vaccine [Table 2]. Three vaccine candidates were generated from OmpA and OmpB membrane proteins: OmpA-49; OmpB-15 and OmpB-24. The immunogenic activity of these antigens has been reported in murine models for their lymphoproliferative capacity and production of INF-γ,; however, it was demonstrated, for the first time, that OmpA-49 and OmpB-24 are capable of inducing T-lymphocyte proliferation and cytokine production using an expression system based on cationic liposomes in macrophages co-cultured with human lymphocytes. This expression system allowed us to immunodetect the HLA-I/rickettsial peptide complex in the macrophages membrane, and to evaluate its stimulating activity on human lymphocytes. Differences in lymphoproliferative response observed in sensitized patients with R. typhi (2/6) and R. felis (7/14) might be due to the diversity of HLA alleles in patients or by changes on amino acids in Rickettsia strains. Bearing in mind the differences in the binding capacity between each peptide and the HLA alleles, it is possible that some will attach with greater affinity, remaining may anchor for longer duration to maintain the stimulus. This has been evaluated by in vitro assays of epitope-MHC binding,. On the other hand, variations on amino acids in Rickettsia strains could be related with the severity of each infection. This corresponds with what has been described in infected individuals with R. felis in endemic areas of Brazil and Mexico,. The low proliferation observed in the cells of the infected patient with R. rickettsii [Figure 3]b may be due to other factors such as the presence and time of circulation of cells with immunological memory, since the patient presented the infection symptoms eight years ago. CD4+ and CD8+ memory cells have been documented to remain 8–12 and 8–15 yr, respectively. It has been reported that, according to the persistence period of some microorganisms such as T. cruzi, CD8+ T-lymphocytes can be identified phenotypically in early (CD27+, CD28+), intermediate (CD27+, CD28– or CD27–, CD28+) and late stages of differentiation (CD27–, CD28–). The protective immunity could be conferred by the first ones with high proliferation capacity, and the last ones could be associated with chronic infections, as they show signs of senescence, and their re-stimulation and persistent activation could develop a type of energy or antigen tolerance,. It is possible that the low proliferative response observed in the R. rickettsii or R. felis infected patient [Figure 3]b is given by late differentiation in CD8+ T-cells, however, this need to be evaluated. Cytokines detected in culture supernatants in response to OmpA-49, OmpB-15 and OmpB-24 DNA plasmids, were those produced by T-lymphocytes (IL-2, IFN-γ) and macrophages (TNF-α, IL-12 and IL-6). The results suggest that the plasmids orient towards a Th1 response to the second exposure with the rickettsial antigen. IL-2 levels have been reported to increase in the first 24 h of culture, and decreases when soluble receptor (sIL-2R) increases,. A significant difference (p < 0.05) was observed in IL-2 levels between patients and controls at 72 h of OmpA-49 culture [Figure 4]a. IL-2, produced mainly by NK and CD4+ Th1 lymphocytes, play an anti-rickettsial role since these induce the proliferation of CD8+ T-lymphocytes. The data suggest that IL-2 levels induced by OmpA-49 can activate CD8+ T-lymphocytes and favour the cytotoxic response against rickettsial antigens; nonetheless, further studies are needed to identify these cells and evaluate their activities against the antigenic stimulus. The presence of IFN-γ, the product of the antigenic activation of CD8+ lymphocytes, Th1 and NK, induces a cellular immune response. Its production at the endothelium level favouring, the destruction of cells infected with Rickettsia has been reported. Significant differences were not found in the levels of INF-γ, between patients and controls, after stimulation with the plasmids [Figure 4]b. It has been reported that IFN-γ synthesis begins at 8 h of culture in rickettsia-activated macrophages, peaking at 24 h. Its synthesis is regulated by the presence of IL-10 and IL-12, suggesting that continuous exposure of these cytokines might decrease the expression of IFN-γ RNA, and suppress the cellular immunity mechanism, leading to fatal cases in R. rickettsii infections. Data of our experiment matched with the low cellular response reported during episodes of lymphocytic proliferation and cellular damage. It was also observed that IL-12p70 levels in cultures of some patients decreased in response to stimulation with plasmids. However, a significant increase was observed in OmpB-24 in patients compared to the control group. Stimulation of PBMC with soluble R. conorii antigens has been reported to decrease IL-12p70 due to the presence of IFN-γ. This could explain the low levels detected [Figure 4]c. However, IL-12p70 levels in response to OmpB-24 seemed to favour the overexpression of IFN-γ as observed in the study. The three plasmids induced a significant increase in TNF-α and IL-6 in the cultures of patients compared to the controls, evidencing the presence of sensitized cells. It has been reported that these cytokines increase in the presence of rickettsial bacteria, focusing on their chemotactic and apoptosis effect at the sites of infection. On the other hand, overexpression of TNF-α has been described in murine and in vitro models in both sensitized and non-sensitized cells with rickettsial antigens,,,. The levels of TNF-α detected in studied patients, in response to plasmids support their role in the inflammatory response and in the proliferation of sensitized cells. Regarding IL-6, increased production between 48 and 96 h of infection with R. typhi and R. parkeri has been observed in murine models, and it is suggested that it takes part in the purification of rickettsiae,,. 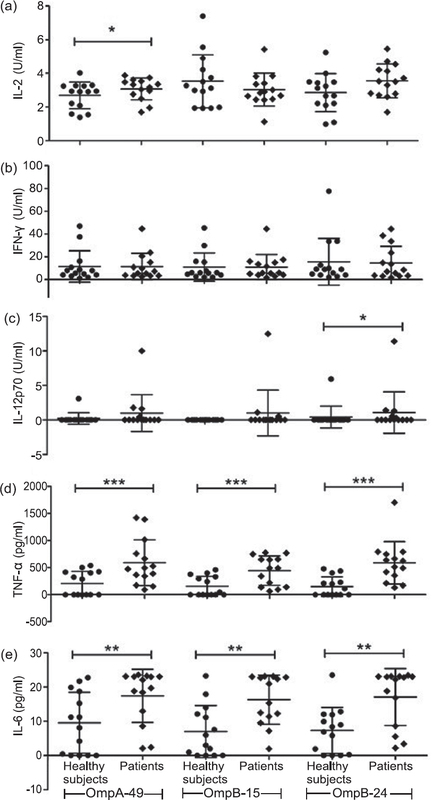 In the present case, OmpB-24 could have favoured the elimination of Rickettsia, which correlated with IL-6 levels and elevated lymphoproliferation rates observed in sensitized patients [Figure 4]e.
On the other hand, the significant levels of IL-6 and TNF-α observed in the patients, compared with healthy subjects, might also be due to the recognition of endogenous pathogen-associated molecular patterns (PAMPs). The presence of rickettsial genetic material in the plasmids could be an endogenous PAMP recognized by intracellular receptors such as DNA-dependent activators of IRFs (IFN regulatory factors) that activate the signalling pathway to induce the type-I IFN synthesis and proinflammatory cytokines in transfected macrophages. The cross-responses obtained with lymphocytes from patients sensitized with R. typhi and R. felis may be due to the presence of conserved epitopes in the sequences of the analysed species and the ability of the antigenic epitopes to couple with the HLA-I alleles. Taking into account that each individual possesses six HLA-I alleles, the presence of peptides in the cloned OmpA and OmpB regions can be coupled with up to four alleles: HLA-A0201, HLA-A24, HLA-B3501 or HLA-B3901. In this regard, the allele A-0201 showed high affinity and longer dissociation time. This variant has an important global distribution, and several studies have considered it in the evaluation of cellular response during the selection of immunodominant peptides associated with CD8+ lymphocytes in microorganisms like T. cruzi,. Thus, the design of a vaccine from these antigens would increase the population coverage and impact especially on vulnerable endemic areas. This is important since the application of vaccines may not be restricted to specific populations where HLA allelic diversity plays a crucial role, and should favour its application to a larger population,,. It is also encouraging that the cross-response to R. typhi and R. felis, possibly due to the presence of conserved peptides, favours the observed proliferation rates, generating higher expectations of cross-protection against similar species. OmpA-49 and OmpB-24 rickettsial DNA plasmids generated and expressed in macrophages are capable of inducing the proliferation of sensitized human lymphocytes. The production of IL-2, IFN-γ, IL-6 and TNF-α from OmpB-24 showed a greater immune-stimulating effect than the others two plasmids, independent of the Rickettsia species involved in the infectious process, likely due to the presence of conserved antigenic epitopes and their binding capacity with the HLA-I alleles. The authors declare to not have any conflict of interest. This work was supported by the Mexican National Council for Science and Technology, grant CONACYT FOSISS 261885. The authors are grateful to Karina López and Raul Tello for their technical support. Bernabeu-Wittel M, Segura-Porta F. Enfermedades producidas por Rickettsia. Enferm Infecc Microbiol Clin 2005; 23(3): 163-72. Minniear TD, Buckingham SC. Managing Rocky Mountain spotted fever. Expert Rev Anti Infect Ther 2009; 7(9): 1131-7. Walker D. “Targetting rickettsia (clinical implications of basic research)”. New Eng J Med 2006; 354: 1418-20. Walker DH, Montenegro MR, Hegarty BC, Tringali GR. Rocky Mountain spotted fever vaccine: A regional need. South Med J 1984; 77(4): 447-9. DuPont HL, Hornick RB, Dawkins AT, Heiner GG, Fabrikant IB, Wisseman CL Jr, et al. Rocky Mountain spotted fever: A comparative study of the active immunity induced by inactivated and viable pathogenic Rickettsia rickettsii. J Infect Dis 1973; 128(3): 340-4. Kenyon RH, Sammons LSC, Pedersen CE Jr. Comparison of three Rocky Mountain spotted fever vaccines. J Clin Microbiol 1975; 2(4): 300-4. Clements ML, Wisseman CL Jr, Woodward TE, Fiset P, Dumler JS, McNamee W, et al. Reactogenicity immunogenicity and efficacy of a chick embryo cell-derived vaccine for Rocky Mountain spotted fever. J Infect Dis 1983; 148(5): 922-30. Vishwanath S1, McDonald GA, Watkins NG. A recombinant Rickettsia conorii vaccine protects guinea pigs from experimental boutonneuse fever and Rocky Mountain spotted fever. Infect Immun 1990; 58(3): 646-53. Crocquet-Valdés PA, Díaz-Montero CM, Feng H-M, Li H, Barret, Walker DH. Immunization with a portion of rickettsial outer membrane protein A stimulates protective immunity against spotted fever rickettsiosis. Vaccine 2001; 20(5-6): 979-88. Viatte S, Alves P, Romero P. Reverse immunology approach for identification of CD8 T cell-defined antigen: Advantages and hurdles. Immnunol Cell Biol 2006; 84(3): 310-30. Schirle M, Weinschenk T, Stevanovic S. Combining computer algorithms with experimental approach permits the rapid and accurate identification of cell epitopes from defined antigens. J Immunol 2001; 257: 1-16. Wege AK, Florian C, Ernst W, Zimara N, Schleicher U, Hanses F,	et al. Leishmania major infection in humanized mice induces systemic infection and provokes a nonprotective human immune response. PLoS Negl Trop Dis 2012; 6(7): e1741. Bourgeois AL, Dasch GA, Strong DM. In vitro stimulation of human peripheral blood lymphocytes by soluble and membrane fractions of renografin-purified typhus group rickettsiae. Infect Immunol 1980; 27(2): 483-91. Carl M, Dasch GA. Characterization of human cytotoxic lymphocytes directed against cells infected with typhus group rickettsiae: Evidence for lymphokine activation of effectors. J Immunol 1986; 136(7): 2654-61. Lima–Junior JC, Banic DM, Tran TM, Meyer VS, De-Simone SG, Santos F, et al. Promiscuous T-cell epitopes of Plasmodium merozoite surface protein 9 (PvMSP9) induces IFN-gamma and IL-4 responses in individuals naturally exposed to malaria in the Brazilian Amazon. Vaccine 2010; 28(18): 3185-91. Bourgault Villada I, Moyal Barracco M, Berville S, Bafounta ML, Longvert C, Prémel V, et al. Human papilloma virus 16-specific T cell responses in classic HPV-related vulvar intraepithelial neoplasia. Determination of strongly immunogenic regions from E6 and E7 proteins. Clin Exp Immunol 2010; 159(1): 45-56. Albareda MC, Laucella SA, Alvarez MG, Armenti AH, Bertochi G, Tarleton RL, et al. Trypanosoma cruzi modulates the profile of memory CD8+ T cells in chronic Chagas’ disease patients. Int Immunol 2006; 18(3): 465-71. Gazi M, Caro-Gomez E, Goez Y, Cespedes MA, Hidalgo M, Correa P, et al. Discovery of a protective Rickettsia prowazekii antigen recognized by CD8+ T cells, RP884, using an in vivo screening platform. PLoS One 2013; 8(10): e76253. Richards AL. Rickettsial vaccines: The old and the new. Expert Rev Vaccines 2004; 3(5): 541-55. Zavala-Castro JE, Dzul-Rosado KR, Peniche-Lara G, Tello-Martín R, Zavala-Velázquez JE. Isolation of Rickettsia typhi from human, Mexico. Emerg Infect Dis 2014; 20(8): 1411-2. Dzul-Rosado K, Peniche-Lara G, Tello-Martín R, Zavala-Ve-lázquez J, Pacheco Rde C, Labruna MB, et al. Rickettsia rickettsii isolation from naturally infected Amblyomma parvum ticks by centrifugation in a 24-well culture plate technique. Open Vet J 2013; 3(2): 101-5. Wenbin X, Raoult D. Taxonomic relationships among spotted fever group rickettsiae as revealed by antigenic analysis with monoclonal antibodies. J Clin Microbiol 1998, 36(4): 887-96. Weiss E, Moulder JW. Rickettsiales Gieszczkiewicz (sic) 1939, 25AL. In: Krieg NR, Holt JG, editors. Bergey’s manual of systematic bacteriology. Baltimore: Williams & Wilkins 1984; 1: 687-701. Andersson S, Stothard D, Fuerst P, Kurland C. Molecular phylogeny and rearrangement of rRNA genes in Rickettsia species. Mol Biol Evol 1999; 16(7): 987-95. Zavala-Castro JE, Zavala-Velázquez JE, Sulú Uicab JE. Murine typhus in child, Yucatan, Mexico. Emerg Infect Dis 2009; 15(6): 972-4. Egui A, Thomas MC, Morell M, Marañón C, Carrilero B, Segovia M, et al. Trypanosoma cruzi paraflagellar rod proteins-2 and 3 contain immunodominant CD8(+) T-cell epitopes that are recognized by cytotoxic T-cells from Chagas disease patients. Mol Immunol 2012; 52(3-4): 289-98. Mustafa AS. Th1 cell reactivity and HLA-DR binding prediction for promiscuous recognition of MPT63 (Rv1926c), a major secreted protein of Mycobacterium tuberculosis. Scand J Immunol 2009; 69(3): 213-22. Znazen A, Khrouf F, Elleuch N, Lahiani D, Marrekchi C, M’ghirbi Y, et al. Multispacer typing of Rickettsia isolates from humans and ticks in Tunisia revealing new genotypes. Parasit Vectors 2013; 6(1): 367. Galväo MA, Zavala-Velazquez JE, Zavala-Castro JE, Mafra CL, Calic SB, Walker DH. Rickettsia felis in the Americas. Ann N Y Acad Sci 2006; 1078: 156-8. Bixby L, Tarleton R. Stable CD8+ T-cell memory during persistent Trypanosoma cruzi infection. J Immunol 2008; 181(4): 2644-50. Martin D, Tarleton R. Antigen-specific T-cells maintain an effector memory phenotype during persistent Trypanosoma cruzi infection. J Immunol 2005; 174(3): 1594-601. Mansueto S, D’Ancona FP, Colletti P, Graceffa R, La Seta F, Pecoraro V, et al. Alteration of interleukin-2 (IL-2) and soluble IL-2 receptor secretion in the sera and urine of patients with rickettsial boutonneuse fever. J Infect Dis 1997; 175(1): 142-5. Jordan J, Woods M, Feng HM, Soong L, Walker DH. Rickettsiae-stimulated dendritic cells mediate protection against lethal rickettsial challenge in an animal model of spotted fever rickettsiosis. J Infect Dis 2007; 196(4): 629-38. Duan C, Meng Y, Wang X, Xiong X, Wen B. Exploratory study on pathogenesis of far-Eastern spotted fever. Am J Trop Med Hyg 2011; 85(3): 504-9. McDyer JF, Goletz TJ, Thomas E, June CH, Seder RA. CD40 ligand/CD40 stimulation regulates the production of IFN-gamma from human peripheral blood mononuclear cells in an IL- 12- and/or CD28-dependent manner. J Immunol 1998; 160(4): 1701-7. Turco J, Winkler HH. Relationship of tumor necrosis factor alpha, the nitric oxide synthase pathway, and lipopolysaccharide to the killing of gamma interferon-treated macrophage like RAW264.7 cells by Rickettsia prowazekii. Infect Immun 1998; 66(2): 558-66. Turco J, Liu H, Gottlieb SF, Winkler HH. Nitric oxide-mediated inhibition of the ability of Rickettsia prowazekii to infect mouse fibroblasts and mouse macrophage like cells. Infect Immun 1998; 66(2): 558-66. Feng HM, Walker DH. Mechanisms of intracellular killing of Rickettsia conorii in infected human endothelial cells, hepatocytes, and macrophages. Infect Immun 2000; 68(12): 6729-36. Kaplanski G, Teysseire N, Farnarier C, Kaplanski S, Lissitzky JC, Durand JM, et al. IL-6 and IL-8 production from cultured human endothelial cells stimulated by infection with Rickettsia conorii via a cell-associated IL-1 alpha-dependent pathway. J Clin Invest 1995; 96(6): 2839-44. Radulovic S, Price PW, Beier MS, Gaywee J, Macaluso JA, Azad A. Rickettsia-macrophage interactions: Host cell responses to Rickettsia akari and Rickettsia typhi. Infect Immun 2002; 70(5): 2576-82. Woods ME, Olano JP. Host defenses to Rickettsia rickettsii infection contribute to increased microvascular permeability in human cerebral endothelial cells. J Clin Inmmunol 2008; 28(2): 174-85. Ishii KJ, Kawagoe T, Koyama S, Matsui K, Kumar H, Kawai T, et al. TANK-binding kinase-1 delineates innate and adaptive immune responses to DNA vaccines. Nature 2008; 451(7179): 725-9. Fonseca SG, Moins-Teisserenc H, Clave E, Ianni B, Nunes VL, Mady C, et al. Identification of multiple HLA-A*0201- restricted cruzipain and FL-160 CD8+ epitopes recognized by T-cells from chronically Trypanosoma cruzi-infected patients. Microbes Infect 2005; 7(4): 688-97. Gonzalez Galarza FF, Christmas S, Middleton D, Jones AR. Allele frequency net: A database and online repository for immune gene frequencies in worldwide populations. Nucleic Acids Res 2011; 39: D913-9. Ugwu EO, Obi SN, Ezechukwu PC, Okafor II, Ugwu AO. Acceptability of human papilloma virus vaccine and cervical cancer screening among female health-care workers in Enugu, southeast Nigeria. Niger J Clin Pract 2013; 16(2): 249-52. Einstein MH, Baron M, Levin MJ, Chatterjee A, Edwards RP, Zepp F, et al. HPV-010 study group—Comparison of the immunogenicity and safety of Cervarix and Gardasil human papillomavirus (HPV) cervical cancer vaccines in healthy women aged 18–45 years. Hum Vaccin 2009; 5(10): 705-19. Sanchez-Casco M, Dumonteil E, Ortega-Lopez J. Production optimisation of a DNA vaccine candidate against leishmaniasis in flask culture. Afr J Biotechnol 2013; 12(31): 4874-80.